I saw this on Pinterest a long time ago and was so tired of commercial cleaners that didn’t work, I thought I’d give it a try. Our home was built in 1921 and still has the original cast iron tub in the main floor bathroom. We had it refinished when we redid our bathroom several years ago, but it just doesn’t clean easily. I was so excited when I tried this out and it worked! The ratio for this mixture is one to one. I find that 1/3 to 1/2 cup of each is plenty for one tub. Measure 1/3 cup (or 1/2) of vinegar in a glass measuring cup. Microwave the vinegar. You want it hot. Pour the vinegar into a spray bottle. 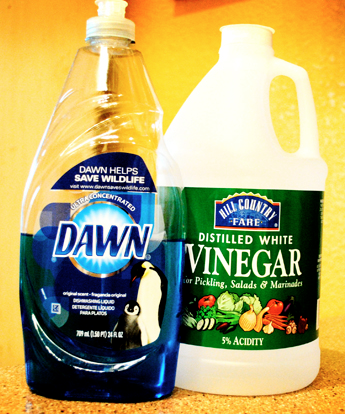 Add an equal part of Blue Dawn dish soap to the spray bottle (either 1/3 or 1/2 depending how much vinegar you used). Add the spray bottle cap and give the bottle a gentle shake just to mix the two slightly. Do not shake vigorously or you’ll get lots of bubbles. Spray onto the tub and shower surface and let sit for about 10 minutes. You will notice that the grime wipes clean easily with little to no scrubbing at all. The vinegary smell is quite strong but dissipates quite quickly and the results are really worth it. My daughter decided to make-up some kind of an oil mixture for her hair and body this week and our tub is disgusting. Normally, the natural consequence for this would be for her to clean the tub, but I wanted to post about it, so I decided to do it myself. Whatever concoction she used, attracted every bit of dirt and grime conceivable to our tub. Here is a picture of the an area I’ve wiped versus an area that hasn’t yet been cleaned. I went to use my Dawn + Vinegar cleaning solution and realized I was out of Dawn. I decided it would be a great time to try out the Sunlight dish detergent I have on hand. I simply substituted the Sunlight for the Dawn and it worked like a charm. We buy a huge container of Sunlight from Costco and I would just buy the Dawn separately for cleaning my bathroom. Not any more ~ from now on I’ll be using my Sunlight for my bathroom as well and saving the extra expense. I actually had Eden shoot a little video clip of me wiping down the tub, but I am having trouble with my YouTube account, so I decided to post without it. Here is our disgusting tub! This is one of those Life Hacks that really works. It is so much better than any of the commercial cleaners I’ve used. It’s much cheaper and takes so much less effort. I highly recommend this fabulous solution. Based on my little experiment today, I would venture to guess that it might work with any good quality dish soap you have on hand. I’d love to hear how it works for you, so leave your comments below. Happy cleaning! Posted on May 3, 2014 by Cindy Roy •	This entry was posted in Health and Wellness, Life Hacks and tagged Dawn and vinegar solution, homemade cleaners, homemade tub cleaner, substitute Dawn with Sunlight, tub cleaners. Bookmark the permalink. What a difference. 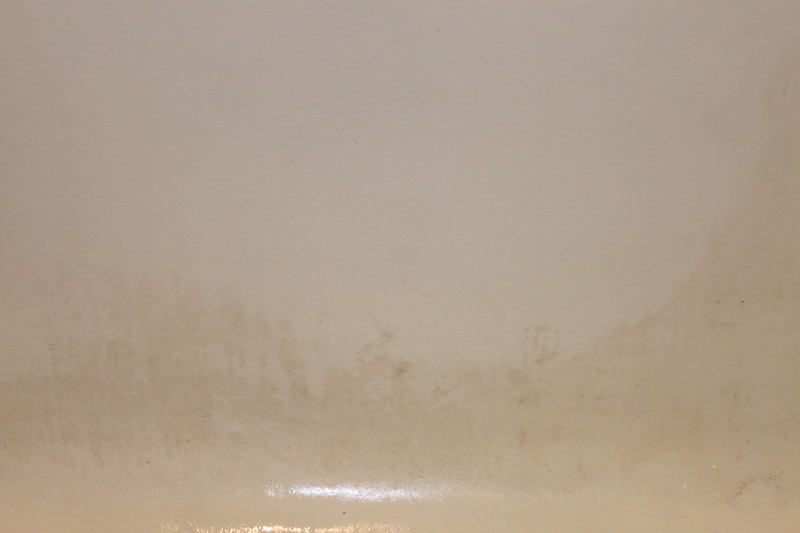 We have glass doors on our shower – do you think it would be okay for these. I love them but they are a pain to clean. I usually use a wet new dryer sheet. Works out okay, but would like to do the whole tub at the same time. We don’t have glass shower doors, but many people who have tried this solution out rave about how well it cleans their shower doors. I’d definitely give it a try! Good luck.